The Cliburn: 50 Years of Gold is the new ‘anniversary documentary.’ Yes, we know the story of Van Cliburn’s great win and the Ft Worth piano contest. But we hadn’t seen the contestant stunned at the dresses in Neiman Marcus or the one who played with a bad back or the show’s grand finale, a terrific bit of cross-cutting. The TV documentary airing tomorrow at 8 p.m., The Cliburn: 50 Years of Gold, has an unavoidable element of elegy, given the announcement last month of Van Cliburn’s advanced bone cancer. But his announcement was probably too recent to be included here. And including it would have meant completely transforming the show into something else. It would have been less an anniversary celebration of the piano competition down through the years, and more — akin to Cliburn’s own surprise appearance at the gold medalists’ anniversary concert — a poignant farewell. 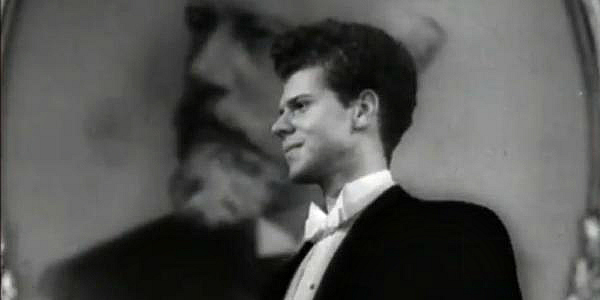 Instead, written, produced and directed by Peter Rosen, 50 Years of Gold tells the familiar story in a very smooth, practiced manner: how a tall American youngster always wanted to see St. Basil’s Cathedral in Moscow, how the Cold War made Cliburn’s 1958 win at the first Tchaikovsky Competition a geopolitical spectacle, how Khruschev told the judges that if he was that good, he should win, how Cliburn returned to a hero’s welcome. Just when you think, “This is thoroughly well-trod territory,” Rosen makes a clever shift. Cliburn’s recollections of Moscow begin to alternate with almost a dozen Cliburn winners’ tales of their own struggles in Fort Worth, including Jean-Michel Schub, Alexander Kobrin, Cristina Ortiz, Hoachen Zhang and Noboyuki Tsujii. So it’s a kind of ‘greatest hits’ package, going back and forth between Cliburn’s experiences and then the pianists who followed him. But it’s shaped along the lines of a piano competition from the arrival of the contestants and their meeting their cordial hosts through choosing the pianos and the elimination rounds. For better or worse, when the modern international piano competition dominated the piano field — thanks, in part, to Cliburn himself — they were exhausting marathon races, the Tour de France of the keyboard: At one point, we see a table, just offstage, loaded down with boxes of over-the-counter painkillers, Advil, Tylenol, aspirin. Kobrin talks about rehearsing one concerto while having to play a different one that evening, then another concerto the next night and another recital the following afternoon. 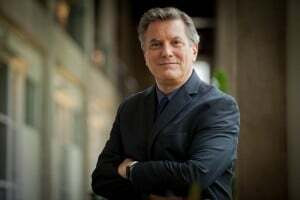 Schub — who should know — declares that all the pressure one might feel in a professional career is concentrated into just two weeks. Vladimir Viardo recalls vomiting before going out on stage. In all this, Olga Kern in 2001 (left) pretty much steals the show. 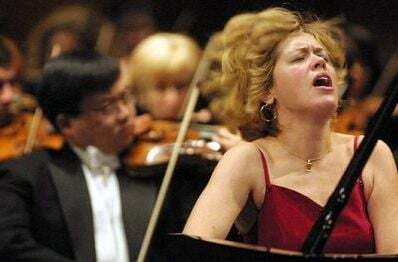 Her vivid, electric playing personified the style of musicianship that piano competitions — so the argument goes — have sidelined for a leaner, less flamboyant professionalism. But she also charms us with her openness. We see her walk off stage, rippling with joy, hopping and stomping. She puts on a gown in Neiman Marcus (“I’d never seen a store like this before”) and is told it costs $2600. Her incredulous “Noo … ooo … ?” is immediately followed by her pulling out her great-grandmother’s crumbling, early edition of Rachmaninoff sheet music. Both scenes hit you with what all of this means to her, musically, personally, financially. In fact, Kern deservedly shares the documentary’s highlight, which Rosen (who’s also one of the editors) saves for nearly the last. Her performance of Rachmaninoff’s 3rd piano concerto is crosscut with Van Cliburn’s performance in Moscow. She learned it listening to his recording, it’s the American and the Russian trading off as partners, embodying the grand Romantic tradition — what Cliburn’s win supposedly meant in the middle of the Cold War, and what his competition has come to mean: past infusing present, the tradition being passed on. Two-thirds of the way through 50 Years of Gold, I was tired of hearing both Tchaikovsky and Rachmaninoff swooning everywhere on the soundtrack (to be honest, I’m not enamored of either), but the Kern/Cliburn montage is a bravura finish. The remaining minutes of the documentary are filled with different speakers explaining what it all means, but if you didn’t catch it with the Rach 3 finale, none of the rest matters.